Carrot Cake Energy Balls | nut-free, gluten-free, vegan, just 4 ingredients! Carrot Cake Energy Balls | nut-free, gluten-free, vegan, just 4 ingredients! 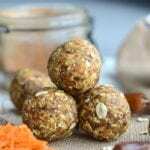 These delicious energy balls take just minutes to make and taste like little bites of carrot cake. Enjoy these for a healthy snack anytime, at home or on-the-go. Add the oats to a food processor or blender and pulse a few times to break them down a bit. Add the rest of the ingredients and mix until it forms a thick dough. Roll into approximately 21 balls. Store in the fridge or freezer in an airtight container.